I am a relatively new jeweler, starting BR-Adornments just shy of 3 years ago as a part time business. I became a widow at the age of 49 in December 2009. After spending all my married life as a full time mother of 3, I found it nesessary to kick my jewelry business into high gear. 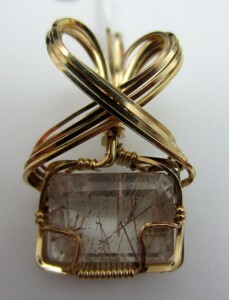 I began by taking classes locally, then entered a year long course at Penn Foster School of Jewelry Design and Repair. In addition I have studied under Wire jewelry indrustry leader -Dale Cougar Armstrong. I am a member of the local art Gallery- Gallery East, a co-op of 40 plus local artists, and have another blog -jewelryenthusiast- at WordPress. I received a call last Wednesday inviting me (my company) to join the 40 plus artists at Gallery East! After my initial shock and awe, I realized not only do I have a fundraiser this month at my son’s school (my company is supplying the jewelry) but I have a jewelry show in 4 weeks! So I am working feverishly to create fabulous pieces for two large events and one fundraiser… when it rains- it pours! I am so pleased to be counted among the artists at the gallery. I have seen their work and they are a talented group. It is an honor. So, goodbye sleep. Goodbye social life. Hello heaps of blessings. .. It’s OK, I’ll rest after the Holiday rush.. sometime in January.